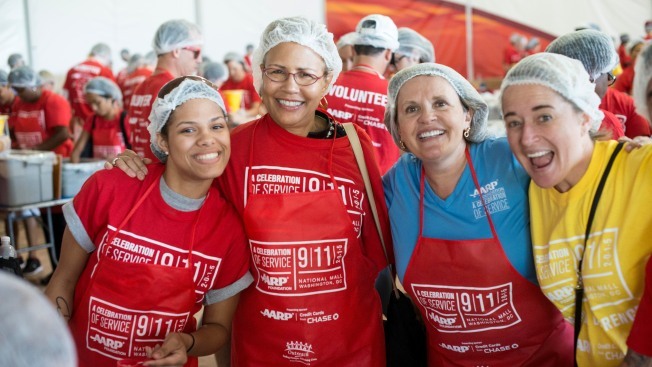 Join 5,000 volunteers for AARP Foundation's Celebration of Service Meal Pack Challenge this September 11-12 on the National Mall. This article is sponsored by AARP Foundation. It does not reflect the work or opinions of NBC Washington’s editorial staff. To register for AARP Foundation’s Celebration of Service Meal Pack Challenge, visit Mealpackchallenge.org. It’s hard to imagine Americans going hungry. But did you know that in this country more than 10 million adults aged 50 and older struggle every day with food insecurity? Often the result of unemployment, a lack of social connections and basic legal rights, food insecurity can have devastating effects on an individual’s health. The problem persists in DC, too, where over 20 percent of seniors face food insecurity. Fortunately, we can help. On Sunday, September 11 and Monday, September 12, join AARP Foundation for their second annual Celebration of Service Meal Pack Challenge event on the National Mall. By aiming to recruit 5,000 volunteers to pack 1.5 million healthy meals, the charitable event will honor veterans and all those first responders who came together in such a remarkable way on 9/11. It will also help lift senior poverty out of the shadows and shine a spotlight on the needs of older adults who are struggling to secure the essentials. Both days run from 8 a.m. to 4 p.m., and volunteers will work in teams in 90-minute shifts. Once packed, meals will be distributed to seniors in need throughout the DC metro area by the Capital Area Food Bank. Are you up for the challenge? Register here to help make a difference in the lives of those in need by being a part of this life-changing event. AARP Foundation works to ensure that low-income older adults have nutritious food, affordable housing, a steady income and strong and sustaining bonds. They collaborate with individuals and organizations who share their commitment to innovation and their passion for problem solving. Supported by vigorous legal advocacy, AARP Foundation creates and advances effective solutions that help struggling older adults transform their lives.